52 Mantels: 52nd Mantel, Halloween Edition PLUS $100 Giveaway! 52nd Mantel, Halloween Edition PLUS $100 Giveaway! The time has finally arrived! Today is the 52nd mantel reveal at 52 Mantels. And, to add to the excitement, my fabulous sponsors and I are giving away one FUN shopping spree to either HomeGoods OR Target. How does $100 sounds?! Pretty great, huh? Before we start the giveaway, let's talk about this mantel, shall we? Because, it's that time of year, my 52nd mantel is a...Halloween Mantel. I'll be honest, Halloween isn't my MOST favorite holiday. Sure, I like candy and yes, I like seeing kids adorably costumed. But, that's not enough to place Halloween on my Top Holiday list. However, it's October and I wouldn't dare show you a Christmas mantel in October. So, Halloween it is! 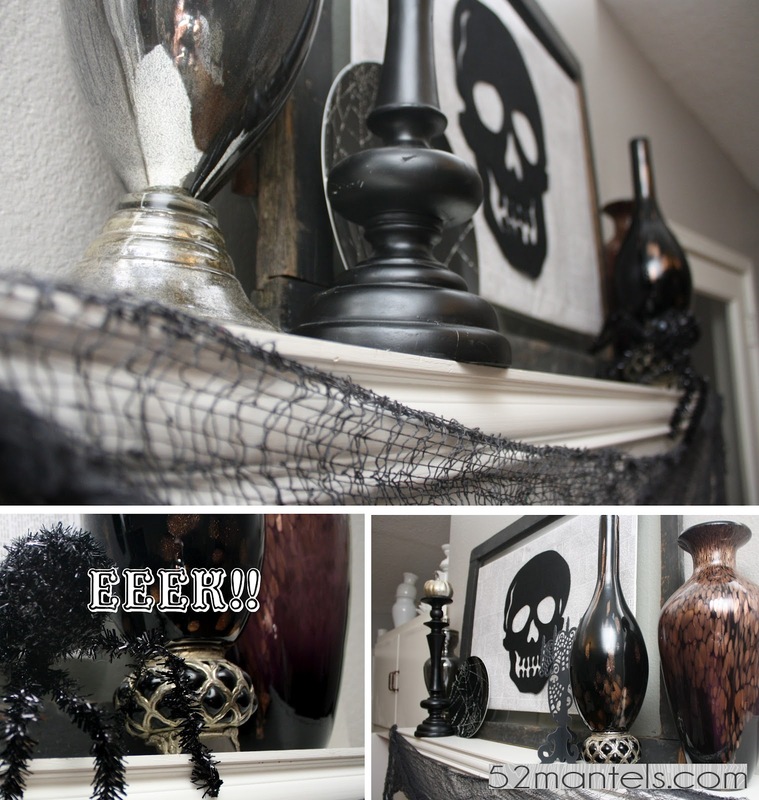 To put together this spooooky mantel, I gathered my dark vases and candlesticks, a plate from Target and some Dollar Tree finds (the felt skull, shiny spider and creepy netting). The skull is glued down to newsprint paper, which is covering a rectangle of foam board. I attached the foam board to an antique window and, ta-da, Halloween Art! Okay, onto that $100 Shopping Spree Giveaway! Follow the instructions on the rafflecopter, visit the 8 lovely sponsors and....good luck! Congratulations on 52 utterly stunning mantels! You have amazed us all with your creativity and superb taste week after week! Congrats on #52 and it is fabulous! Love "The End" sign! I've enjoyed all of your mantels. You are so creative! You made it!!! Good job! OK, I think I will just breeze right past the Fall mantel that may never get done here, and head right on to Halloween Mantel. Looking good and as my original mantel inspiring blogger I must celebrate your #52 by getting one done. Congrats my dear friend!! Your mantels have inspired so many! 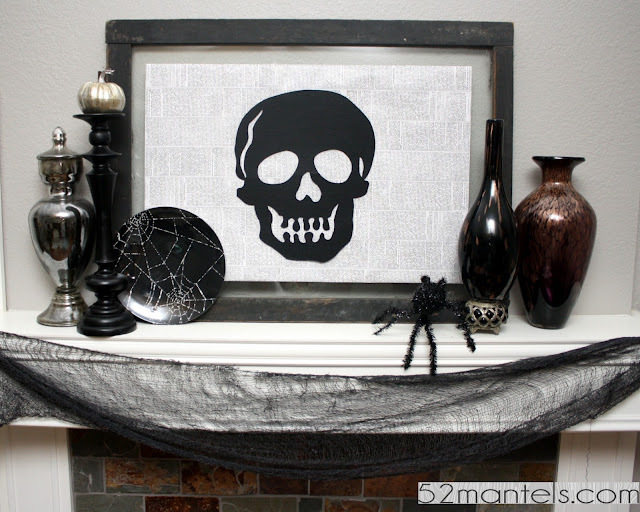 I love the skull art you made for this one, that is what I love about all of your mantels. The creative, homemade touches you add each week. You are amazing and I can't wait to see what you have in store for us in the next year! So exciting! I'm glad I discovered you, to follow along the majority of your mantels. Best of luck in the next year too--looking forward to it! HA! Thanks for all the great inspirations and wonderful mantels! You are BY FAR my favorite "Blogster"!!! 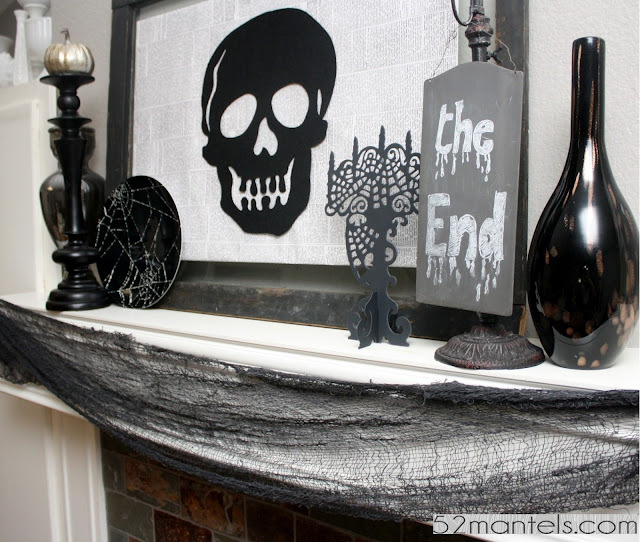 love all things fall and halloween, so this mantle with it's creepy sign is right up my alley. Congrats on your 52nd mantel! I wish I had the creativity and ability to shop my home that you have in order to change out your mantel so frequently! YAY! Congratulations on #52! All your beautiful mantels have inspired me to finally decorate mine for Fall... I can't wait to link it up next week! Woohoo!!!! What a fun year it's been! You're still my favorite genius, and I'm sooooo proud to call you my friend! 52 rocking mantels -- congrats, Emily!! Wow! How fitting that you were able to end on this great Halloweeen Mantel. Incorporating the End sign was genius!! But I truly hope this is not the end! !I have enjoyed all of your posts immensely, your creative mind is an inspiration to us all! Oooooh, love the skull; what a great idea!!! This morning reading your blog I was inspired to put together my fall mantel. THANK YOU! I've had the best day. Don't you just love it when you get a little bit of inspiration and it kicks your booty into doing something FUN? ooooh, creepy but cool all at the same time. Congrats on 52, so fun! :) I miss having a mantle to decorate but I usually find all sorts of other surfaces to have fun with during the seasons. Congrats on #52! Love it! 'd like to invite you to share it at my party, Twirl & Take a Bow at www.houseontheway.com. Hope you can join in on the fun! What an awesome mantel! And congrats on #52!!! !